Every year, at the end of September, our medical school do an annual pub-crawl where every fresher has to attend in PJs. However, it is a free-for-all for everyone else with fancy dress. Our previous highlight, and inspiration, had occurred when we were freshers. There was a group of Lego minifigures, with cardboard heads, arms, torsos, legs, AND SHOES! This was to the point that they even walked like you would imagine minifigures would. Since then, our friendship group had always dreamed of going as big as they had for a fancy dress costume. Flashback to the start of July, and I’m studying for my exams (for July’s end). It is then that I see a transforming Ferrari Formula One car on YouTube. Within the 30 seconds of video footage, I decided that if I passed my exams, I would celebrate this (and my last year studying on campus) by building something similar, as well as an entire pit-crew, except in the colours of Red Bull Racing. Having pitched the idea to friends, a team was set-up, exams were completed and passed, and work could get underway! One of the most challenging aspects was designing the costume. As no-one had taken detailed pictures of the previous car, and only video, I had to spend many hours arched over my computer studying the videos very carefully. I also had to measure myself, giving me some figures over how long everything could be. Using a cardboard box that approximated the length of my torso, I started to turn this into the base of the body, attaching elastic to make it wearable, and using ample gaffer tape to make it as stable as I could. I also built both side-pods, using two curved cardboard sections for each one, joined by a curving cardboard strip that took ages to attach! After a preliminary test of folding (see photo), I created the engine cover, and finished attaching cardboard to some shoes to make the wings. Numerous paper-models later (to ensure I was getting measurements right), I had built all the triangular sections that I needed to construct the engine cover, and the car was beginning to take shape! Once I had made the nose and front wing (with additional winglets, as this was a “Red Bull” car after all! ), then came the biggest challenge yet, in whether the nose would attach to the body. Fortunately, my first attempt (two thick cardboard strips connecting the two and attached with metres and metres of gaffer tape) did the job, and after more reinforcement and further additions, I was ready to paint the costume! I was very happy at this stage, as for the first time, the dream did seem like a reality, especially as some of the more complex problems seemed to have been sorted. Having bought and mixed some paint, I applied primer to the entire costume. After this was dry, I worked on the paint, which approximated to deep black on all interior parts (and wheels), and blue for the exterior. While the paint was drying, I also constructed and printed decals for the car. As we wanted to go the extra mile, we had styled ourselves as a parody of Red Bull Racing, called “Jägerbomb Racing”, after the infamous Jägermeister and Red Bull shot. 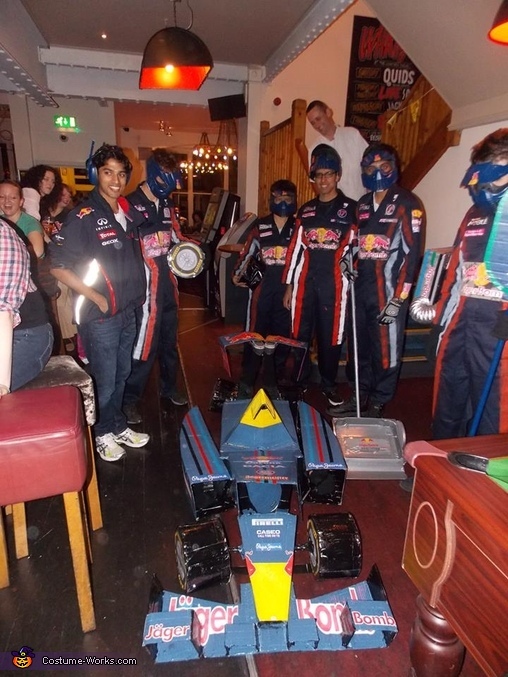 Therefore, Red Bull became Jägerbomb, and virtually every other sponsor on the car was given a makeover! These sponsors were printed on paper and cut-out for sticking on the car, as well as onto t-shirt transfer paper, for ironing onto the pit-crew boiler suits. While I couldn’t see it, the first fold was one of the sweetest moments of the summer. Three long weeks of work was finally paying off, and everything was holding up! After a few practice folds (to make sure my arms and legs were all in the right place), I was ready to “drive” the car up to university (in another car of course). After finishing university for the day, on Tuesday 24th September, we all got dressed and ready; everyone else with their boiler suits, myself (with some assistance) with my boiler suit, the costume body, rear tyres (which attached to the boiler suit legs with Velcro) and rear wings (all attached to my shoes and decaled up). It was then that we made the 10 minute walk to the first pub. Even down the first street, we were getting lots of stares, but no-where near as many as when I folded for the first time. Whenever I folded down, all I could hear were gasps of surprise, shouts of “Oh my god, it’s a car!” and infinite flashes of cameras and phones! Pretty soon after, the pit-crew team had started doing “pit-stops” on my car whenever I folded, even working down to a seven-second stop once (see video for proof), and starting to “service” taxis and buses on the road. They swear that some cars starting coming down the street just to get pitstops! After multiple folds, and multiple congratulations on our work, we were named “Best Costume” of the night. Far too much work went into the whole thing, but I would always say that it was worth it, for the feeling of accomplishment, and for the reactions on the night. Harking back to the start of my write-up, I like to think that we became the new “minifigures” for all the freshers; the ridiculously over-the-top costume that everyone wanted to be wearing on the night, as well as the costume that has inspired them to make as much effort as we did for next year!